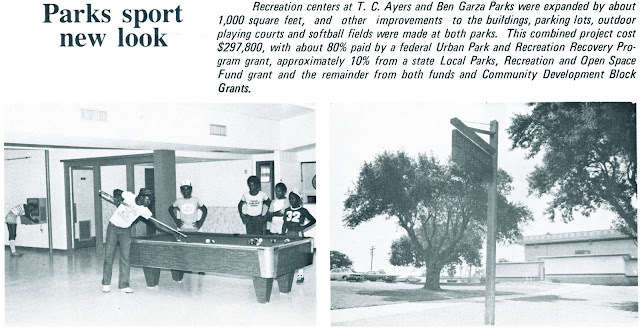 This park and Ben Garza Park were renovated in the early 1980s with funds obtained from an Urban Park and Recreation Recovery (UPARR) rehabilitation grant. I was the lead writer for the City of Corpus Christi's Park and Recreation Department (PARD) on the application submitted in November 1979, with the grant awarded the following month. Below is a clipping from page 3 of the August 1982 edition of the City of Corpus Christi employee newsletter, City Quill, reporting on the progress of the projects. By this time, I was working for the city's public information office that created this newsletter, and I took the photos and wrote the caption. Sadly, according to the article "Bridge design to take more right of way in T.C. Ayers Park" by Kristen Crowe in the April 30, 2016, Corpus Christi Caller-Times, all but about three acres of the 8.77 acre park, acquired in 1938 and named after T.C. Ayers, the first principal of the nearby African-American Solomon Coles School, will be part of the right-of-way for the new Harbor Bridge. The recreation center, according to Section 5, page 4 of the Final Environmental Impact Statement (EIS) for the Harbor Bridge replacement project, "was closed by the City of Corpus Christi in 2007 due to underutilization. The recreation center activities continue to be provided at an alternate facility, the Solomon Coles Recreation Center [the former school]..., six blocks to the east in the same neighborhood." Below: EIS Illustration 5.2-2. T.C. Ayers Park playground equipment, about November 2014, with the covered basketball pavilion in the background. The EIS goes on to say that the nearby swimming pool (not part of the UPARR project), as of November 2014, "is currently operated by the YMCA...open free of charge to the general public for about 12 weeks between June and August." The pool is likely still maintained by the city and appeared to be in excellent condition during our visits in June and July, 2016. When I learned that the Harbor Bridge replacement project would negatively impact T. C. Ayers Park, I was curious if there were any limitations to changes in the land's use due to the UPARR funding. Turns out, according to Appendix B of the EIS, there are. In a February 4, 2013 letter (page B-285) from then-PARD director Michael Morris to TxDoT, it is noted that "included with the funding was a requirement that the park to remain in use as a park into perpetuity....The perpetuity requirement may be converted to a new park and/or recreational property upon consent by the NPS [National Park Service]." According to that same Appendix B (page B-331), the City plans to transfer the perpetuity requirement to a new park to be developed at the site of the former Booker T. Washington Elementary School (mistakenly called the Carver school in the Historic Resources Survey Report). 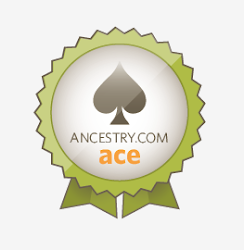 It is within walking distance of T. C. Ayers Park. Funds for the development of this park, as well improvements to the pool (which would remain), would come from TxDoT. Interestingly, the funding would also include improvements for the nearby five-acre Dr. H.J. Williams Memorial Park. Acquired in 1927 and once called Hillcrest Park, it was renamed in 1986 for the physician, former president of the local NAACP, and civil rights activist. This park was the recipient of a $40,000 UPAAR rehabilitation grant in July 1980, the application for which I also coordinated in February 1980. And what about Ben Garza Park? Acquired in 1938, this 10.85 acre park with its gym and recreation center (site of a Red Cross disaster relief center I helped supervise after Hurricane Allen in August 1980) was named for Bernardo "Ben" F. Garza, entrepreneur and a founder and president general of the League of United Latin American Citizens. According to page 5-34 of the EIS, it is supposed to receive enhancements as mitigation for the loss of T. C. Ayers land, as well as all of Lovenskiold Park, a tiny (0.7 acre) "special use" park acquired in 1937 and named for Dr. Perry Gray Lovenskiold, who served as the city's mayor from 1921 through 1931. His brother, Oscar C. Lovenskiold, was mayor 1892-1902. However, according to a June 22, 2016, news story by Caroline Flores of KIII-TV in Corpus Christi, the City Council was discussing the future of the park in executive session. No word on what if any decision they made, but this park would also be affected by the UPARR perpetuity provision. Sentimental Sunday: Happy New Year (from 1976)!